12.4% of residents struggle on incomes below federal poverty level and 47.10 % of children in FDL School District qualify for free/reduced lunch. 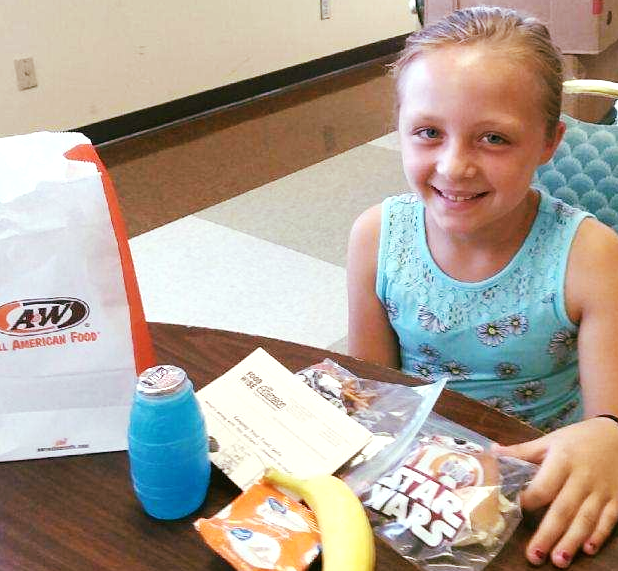 Every summer, The Salvation Army helps cure childhood hunger by providing 18,000 free brown bag lunches. An average of 1386 households visited our food pantry monthly. The Salvation Army Food Pantry is Fond du Lac County's largest food pantry, freely distributing upwards of 700 tons of food annually. Helping OTHERS have a healthy lifestyle. Our food pantry is a beacon of help to those we serve, like the grey haired couple who came to us with calloused hands and back bent from years of working farmland that had been in the family for generations. Then cancer came and took his health, their life savings, the farm and their dignity. Hungry, they came to our food pantry looking for help. The little preschool girl, about 3, who stood in the food pantry asking, "Is this where the food is" Mom says there is food for us here." Her eyes sunken with need, focused on us, "Please," she called out as she ran to a cart, turned it around, "This is my baby brother, Kevin, can he have food too?" The pantry is stocked by donations from businesses and individuals. Along with food and equally important are the personal care items and cleaning supplies we stock. Food Stamps/Quest cards do not cover these necessities and those who can't afford them depend on our supplies, or otherwise may go without. When the pantry is low, goods are purchased with donated money. *Note we are unable to take partially used, already opened packages and food expired a year or more. Clients visit the food pantry Monday, Tuesday, Thursday and Friday 9:00am - 12:30pm and Wednesday, 9:00 am - 11:30 am and 12:30 pm - 5:00 pm. Clients are able to return to the pantry once every 30 days, and the amount of food they receive depends on household size. A pantry card is created and kept on file for each household using the pantry. Proof of ID and residency required. Our food pantry is unique as it offers clients opportunity to select items from different categories on our shelves. This shopping experience, along with the comfortable waiting area and the personable volunteers and staff provide a dignified experience clients appreciate. For more information, contact our Food Pantry Coordinator. To make a financial donation, click here. Fond du Lac's oldest free summer brown bag lunch program feeds children every Tuesday and Thursday all summer, and has since 1993. "This tremendous tradition remains possible because the community supports it whole-heartedly," Barb Thill, Brown Bag Lunch Coordinator shares with conviction. This year's season runs Tuesdays and Thursdays, June 12 - August 23. The operation is headquartered in The Salvation Army's 237 N. Macy St. Fellowship Hall. Assembly begins at 8:30 am. By 11:15 am, lunches are ready to serve at Lakeside Garden Apartments, Church of Peace, and Maplewood Commons; at 11:30 am The Salvation Army Fellowship Hall distributes lunches. Each lunch includes a peanut butter/jelly or meat sandwich, fruit, chips/snack, a beverage, and a dessert. The planning team asks for donations to pack 18,000 lunches and feed children who would receive free/reduced lunches during the school year. Volunteers of all ages are needed to power this mammoth undertaking. Contact The Salvation Army, 237 N. Macy St. Fond du Lac; 920/923-8220 or email FDLSAinfo@usc.salvationarmy.org.